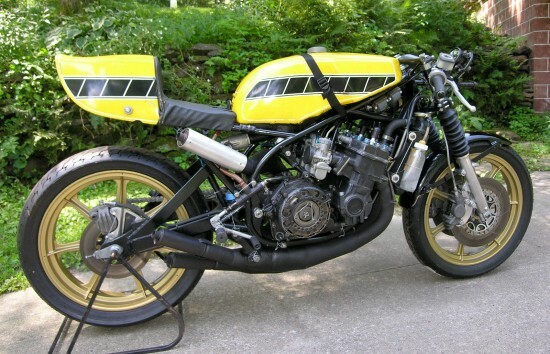 Looking like the world’s angriest bumble bee, complete with four stingers, this Yamaha TZ750B race bike is ready for a new life, terrorizing tracks in vintage racing classes. And “terror” is probably the right word: with as much as 140hp, the TZ750 was very fast and exceptionally reliable, although the concept of handling was still in its infancy and a “good-handling bike” was any motorcycle that exhibited cornering or straight-line behavior that didn’t involve a terminal death-wobble. The earliest liquid-cooled two-stroke fours look suspiciously like they were built up from a pair of 347cc parallel-twins to make the TZ700. The later 750cc engine that debuted in 1975 supposedly shared no parts at all with the smaller machines and was essentially a bored-out 500 Grand Prix engine. Power predictably overwhelmed the bike’s rudimentary handling and primitive tires. Early machines used a twin-shock rear, although the frames were eventually updated to a more modern monoshock design as seen here: this particular bike was obviously ahead of its time and uses a rare Kanemoto frame, according to the seller. Show Winner – Fresh Rebuild – Race Ready. 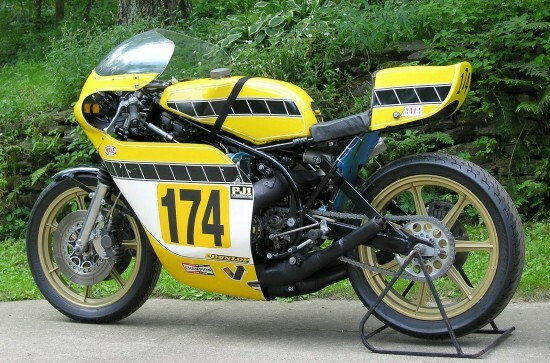 Very Unique Early TZ750; C&J Mono-Shock Frame equipped, Raced in the 1976 and 1977 Daytona 200! 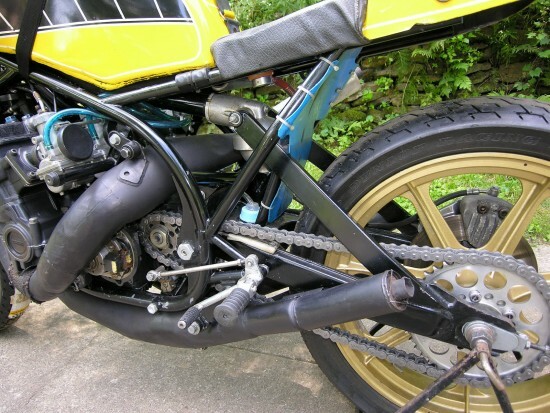 C&J made 4 special TZ750 mono-shock frames for Erv Kanemoto in the mid 1970`s. They were ridden by Gary Nixon, Freddie Spencer, and Gary Fisher. 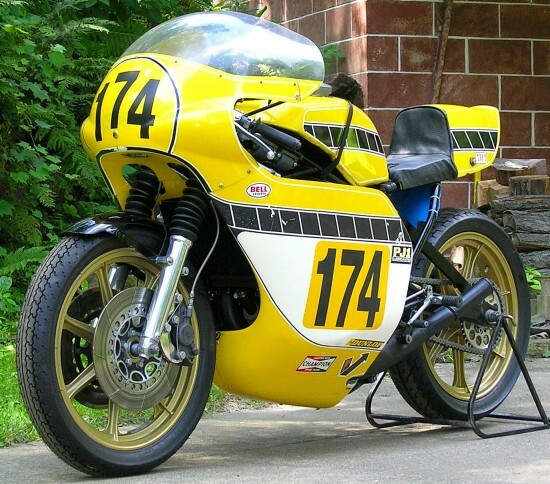 This particular unnumbered chassis was built using a 1975 TZ750B donor bike, and made it into the hands of AMA Pro rider Cory Ruppelt; he finished in the money in the 1976 Daytona 200 Roadrace on this bike. Original period equipment includes: Morris Magnesium wheels, Lockheed front calipers, early Vesco fairing, and silenced crossover chambers. Modern KR series Dunlop racing tires, D.I.D. endless chain, and Boysen reeds make it track-worthy. Rebuilt motor has 1 hour track time; tear-down inspection just completed. Un-numbered cases. Genuine TZ750D Master Cylinder just installed – carbs, ignition, controls, forks and C&J modified bodywork are original TZ. The bike is near exactly as raced in the 1970’s including paint. Has been preserved for 30 years on display before being brought back to a rider. Unrestored from the 1970’s, in “as-raced” condition. The seller also includes some on-track video of the bike doing some parade laps here. 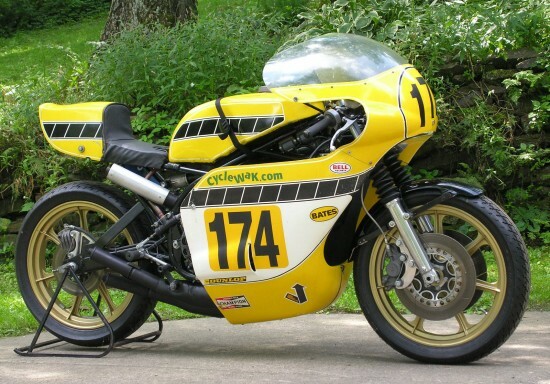 Many classic racebikes are non-running display pieces with too much history for the owners to risk a crash, or because they cannot afford the upkeep on a rare, non-production machine more than forty years old. Luckily, this particular bike comes with period looks, unrestored paint, and a refreshed motor that looks like it’s ready to rock. 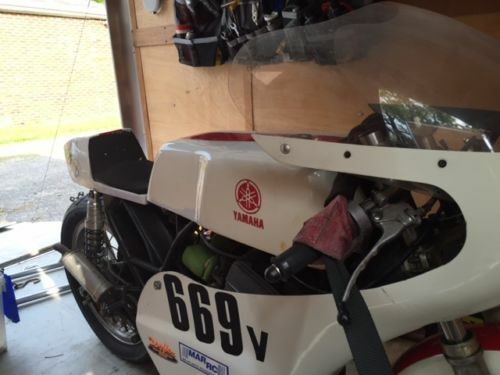 ebay is raining TZ 750’s right now. There are 3 up for sale. I noticed! Planning to post one up here and the later one up on RSBFS.